Hello! We are so excited to commence our NEW stamps previews today!! We head off to Creativation in Phoenix next week, so will be launching our new designs before we go..
pre-order from Friday January 12th! 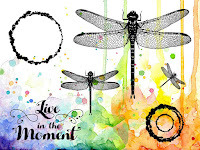 Created by Mark from blown ink, these superb stamps are incredibly organic and so versatile! These stunning projects will be blogged over the coming weeks, so keep an eye out for them. We really hope that you love these incredibly arty new stamps, all designed (of course) by Mark Alexander! Come back tomorrow to see a brilliant new collection of stamps!! Thanks again for visiting us here on the Visible Image blog today, have a great Monday. Always Wear Your Invisible Cape! Hello! We have double the inspiration for you here on the blog today. ‘Happy New Year’, and I hope that 2018 is a really good year for you all. 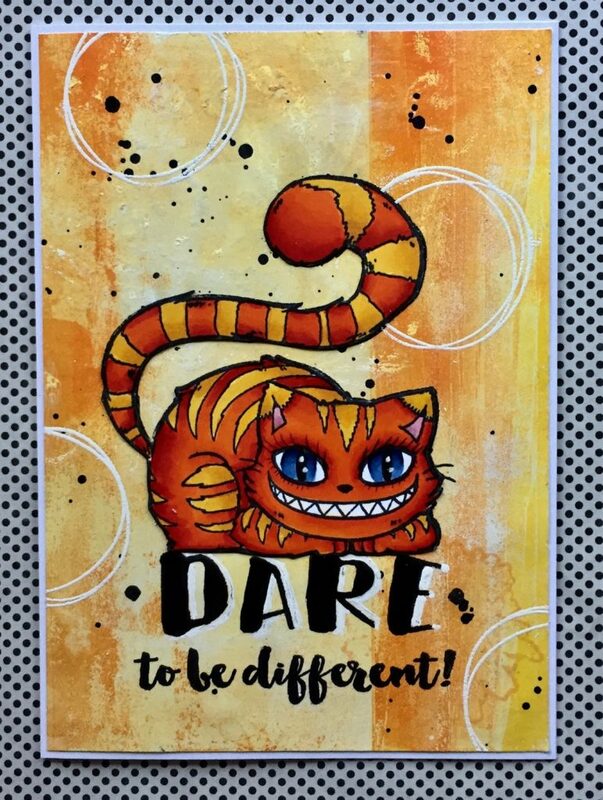 I am starting this year, with a colourful card that I’ve created, using some awesome Visible Image Stamps, and one of their fabulous stencils. Hopefully this card will have a little bit of an uplifting effect, for those who need a boost this time of the year. The background was achieved using Brusho’s. I placed the stencil on top, and blended over it with similar coloured Distress Inks, I also added a floor, using some black Distress ink. 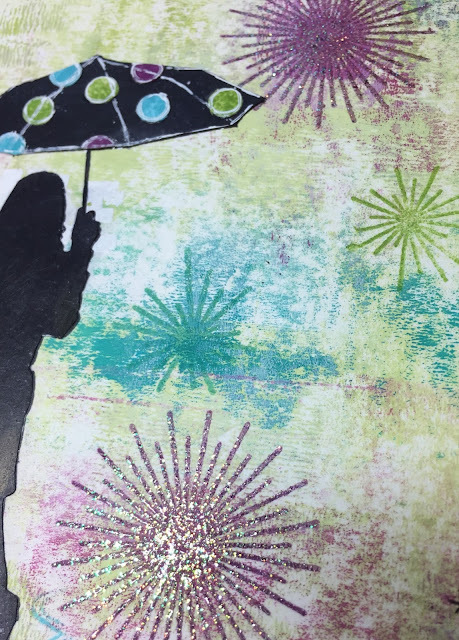 On a separate piece of white card I stamped the Rain lady from ‘ Sparkle in the Rain’, with an embossing pad, and heat embossed her using Wow Persian Indigo embossing glitter, I then fussy cut her, missing off the canopy of her umbrella. Again using the embossing pad, I stamped the wings from ‘Angels are Near’, using Metallic Gold Rich, and heat embossed, fussy cut them, and coloured them with Mustard Seed ink. 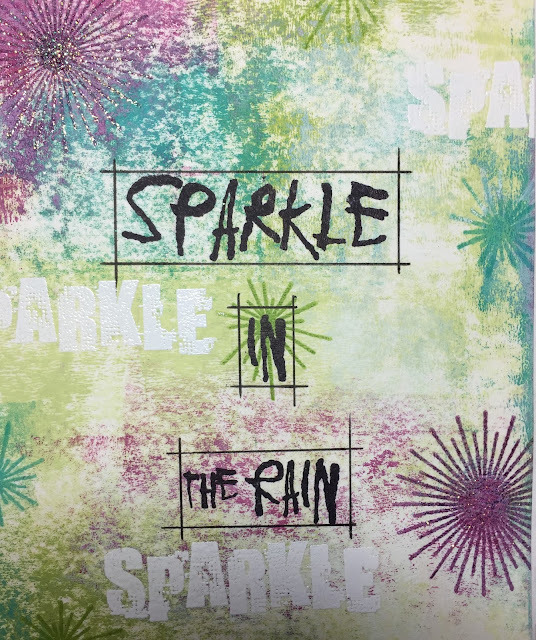 For the sparkle on top of her wand, I used heat resistant acetate, on which I stamped the smallest sparkle stamp from the ‘Ray’s of Light’, with an embossing pad, and heat embossed using White puff Twinkle, the sentiment was stamped onto purple card, using the same method. I hope you are all getting excited, next week there will be sneak peeks of the new Visible Image stamps, which will be released later this month, they are really awesome! 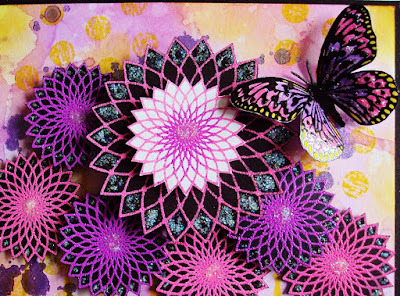 You will find more of Pauline’s fantastic cards and projects over on her blog. 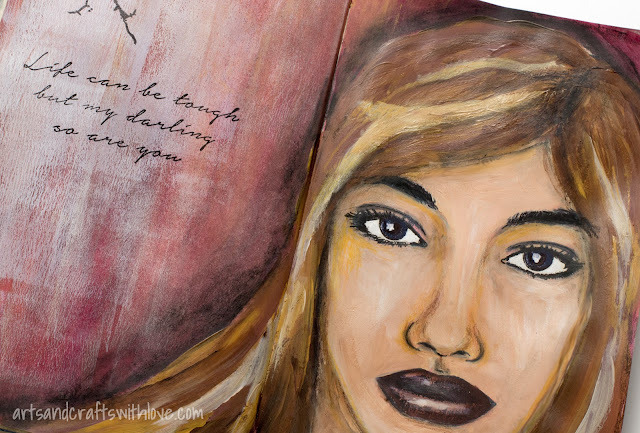 We will be back with a superb journal page from Josefine Fouarge later this evening. Hi there! We hope you have had a lovely weekend. If you have been following our blog you’ll know we have introduced 10 awesome new designers joining the team here at Visible Image. And, this weekend we are showcasing some of our favourite creations from the amazing designers who are staying on the team! Hello. I’m Eileen Godwin and have been happily crafting since 2004. After trying all sorts of crafty products I’ve found that Stamps and Inks are ‘my thing’ ! I retired at sixty, in 2008, after a full time career as a Pharmacy Manager in Retail Pharmacy. It was a stressful job but now I can craft all day! I live in a small village near Rochester, Kent, with my husband Ken and we share our home with two small doggies whom we adore and four ferrets! When we go on holiday they ALL come with us ‘cos ”We are family!” I have a Blog and run Craft Workshops in my local Village Hall. You will find more of Eileen’s beautiful cards over on her blog. 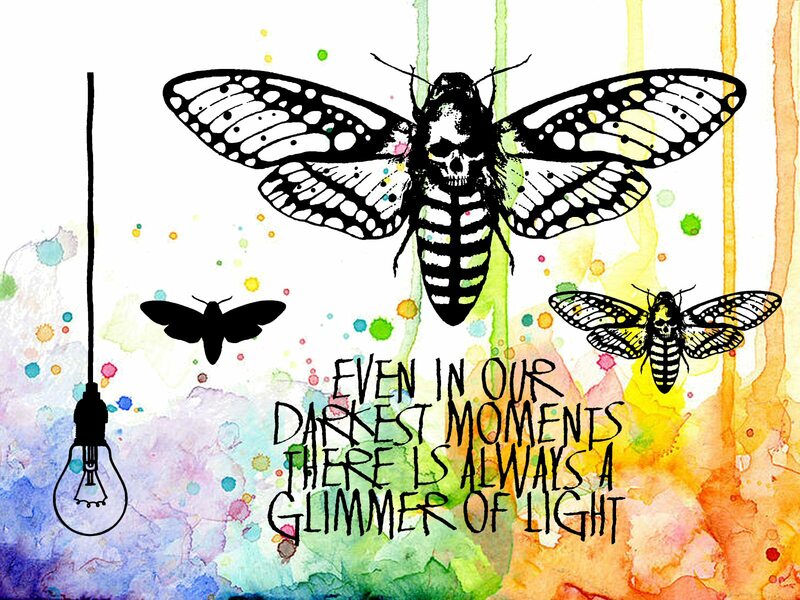 We look forward to sharing more wonderful inspiration from Eileen over the coming months. 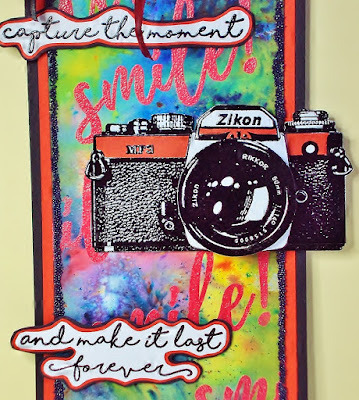 We will be back later this evening with a stunning tag from Veerle Moreels, as inspiration for this month’s challenge over in our Facebook group. We are excitedly announcing our awesome NEW Design Team members every day this week! Hello all, my name is Tenia Nelson and I am a 30 something wife, momma, doggie momma, jazz pianist, music teacher, soccer player and paper crafter that lives in the 5280 (Denver, CO)! I am married to a wonderful guy named Tim, I am momma to my awesome son Thelonious (Theo) and I have two wonderful doggie “kids” Miles and Brillo. 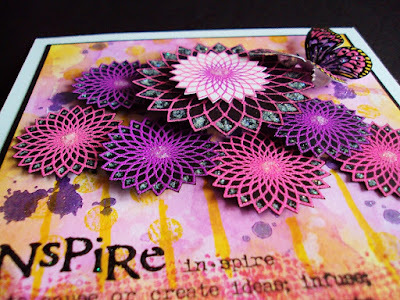 I love me some paper, inks, stamps and embellishments… and just LURVE to create!!! 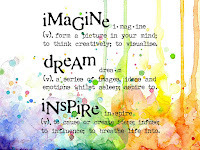 I am so excited to be on the Visible Image Design Team…. Woot Woot!! Thanks for the opp, Helen and Mark!! 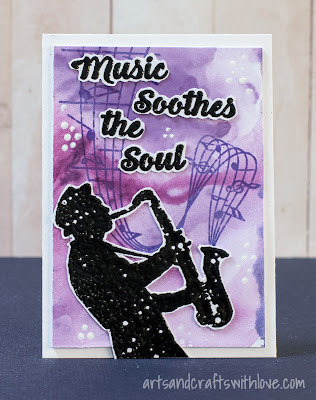 You’ll find more fantastic cards over on Tenia’s blog. We love Tenia’s style! 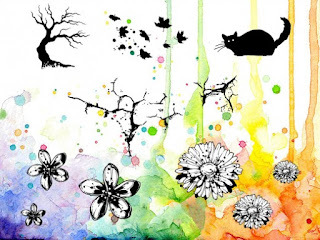 Her cards are super cool, with splashes of ink awesome layers! 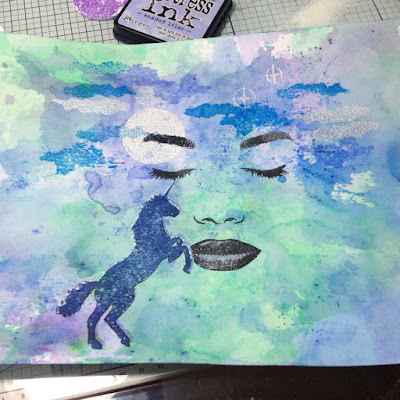 We are so excited for Tenia to start inspiring you with our stamps and stencils! If you have missed any of our announcements so far, you will find them HERE! We are excitedly announcing our amazing NEW Design Team members every day this week! I have been creative in some way all my life. 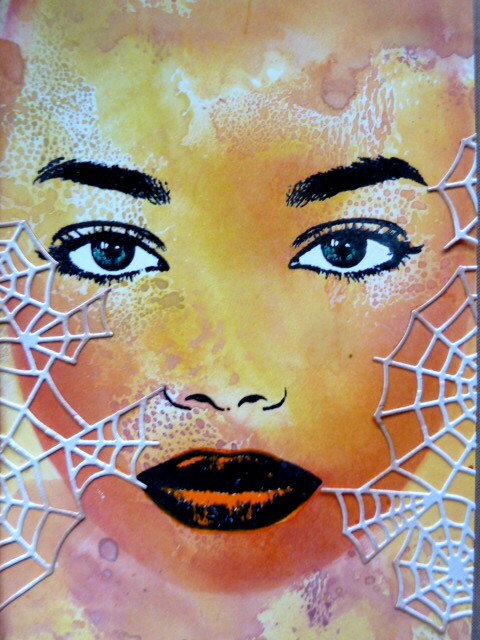 I have been scrapping since 2003 and love mixed media, art journaling and scrapbooking. 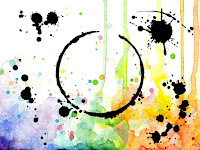 Getting messy and creating completes me, and to be able to share my projects is a bonus. 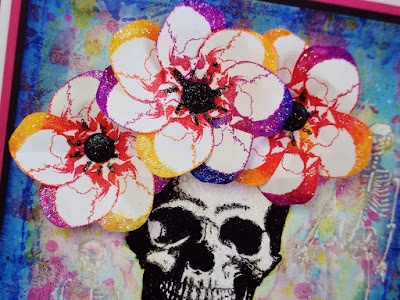 You will find more awesome projects over on Lynn’s blog. 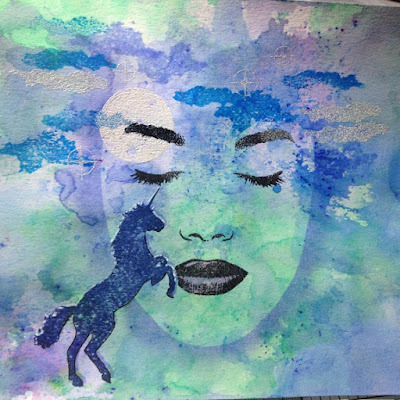 We adore Lynn’s painty, inky style! 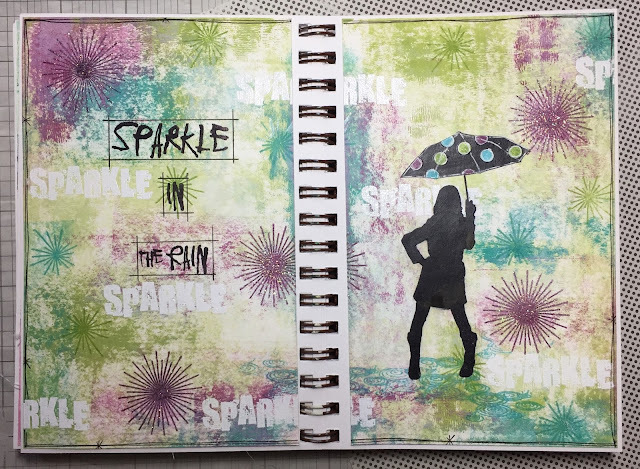 Her scrapbook layouts are so striking, with lots of gorgeous texture. 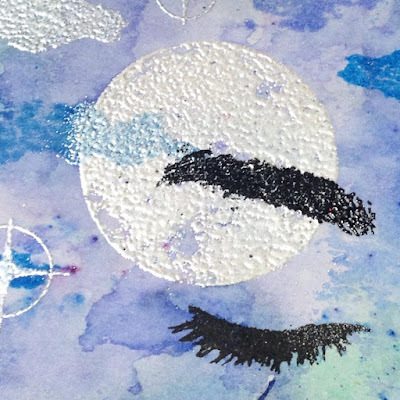 We are so excited for Lynn to start inspiring you with our stamps and stencils! Hello! 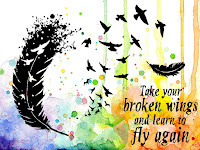 We hope you are enjoying all the inspiration we are sharing here on our blog today. You are getting two projects from me this week! 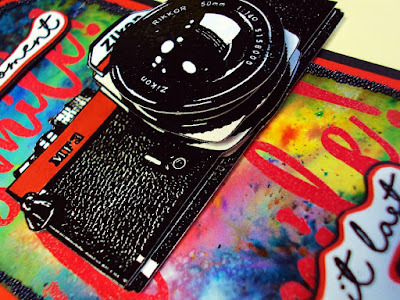 They are both created using some of the awesome new stamp sets available from Visible Image. I found this paddle thing in my MDF stash, and thought it would be perfect for an underwater scene, so using some acrylic paints I painted the background, then added the little fishes and the sentiment using Versamark and heat embossed with some Blue sparkle Embossing powder. I also popped some bubbles randomly around using some white ink. 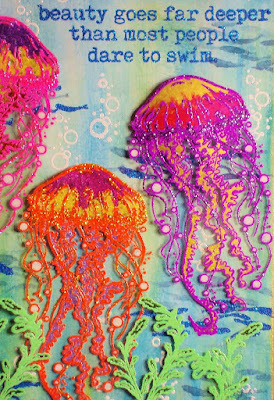 The jelly fish and the seaweed were stamped onto heat resistant acetate with Versamark, and heat embossed using different colours of Embossing powder, then fussy cut. I painted on the back of the jellyfish, using Starlight paints. and heat embossed it with white powder, I also did the same for the sentiment. and heated from underneath, this gave a sort of splashed look. to spend on some new stamps over in the Facebook group! 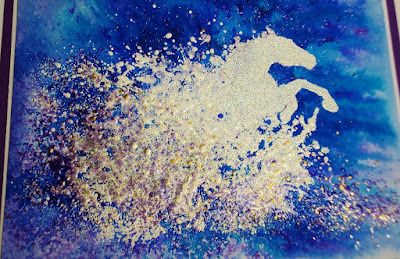 The effects created around the horse are superb! 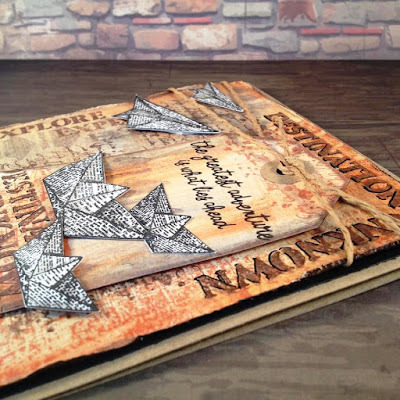 Next today we have a gorgeous tag created by Veerle. Hello! Thank you for visiting our blog today. Well what a busy show we had on Create and Craft last Saturday, sold out of virtually everything in less than half an hour! This was followed by a very very busy week which has flown by so fast!!! Apologies for neglecting our blog, but I (Helen) have been ill all week so it’s been a struggle to get everything done. Hopefully you follow us on other social media sites and will have seen some of the amazing inspiration we have been sharing! So, we are playing catch up here on the blog again and we have a wealth of stunning projects coming your way over the weekend. Today I am sharing a card I made with Destination Unknown, one of the NEW stamp sets from Visible Image. 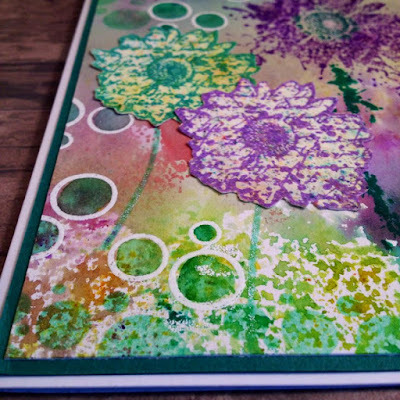 I have used a gelli printed background. I think these paper boats are so cute! Love this card Corrie… perfect sunset over the sea background! You can find more of Corrie’s projects over on her blog. We will be back with a stunning card from Dot next! We have a few more wonderful projects to share today, so we hope you will visit us again soon. 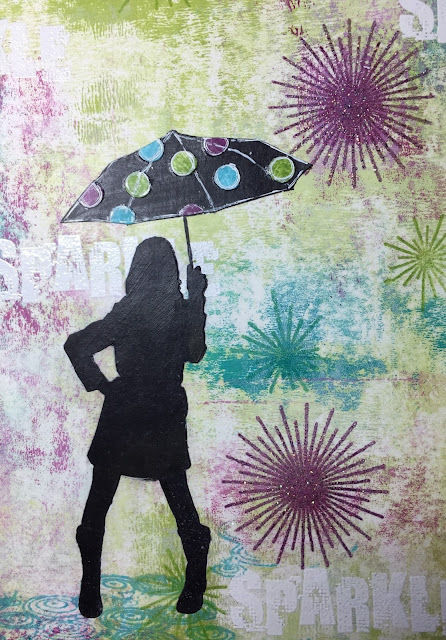 It’s my turn to share a creation using some if the awesome new stamp sets from Visible Image Stamps. 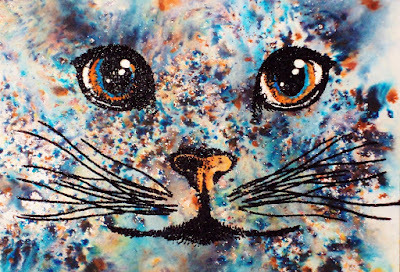 Curious Cats and Create It. added a couple of trees from the ‘Create It’ set, and used the ends of the whiskers for the grass. 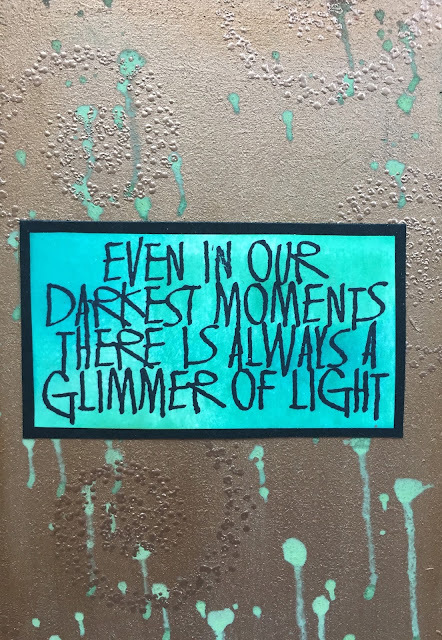 and the sentiment with Versamark, and heat embossed using Black Glint Embossing powder by Wow. I bleached out the eyes and nose, and coloured them with Distress inks. 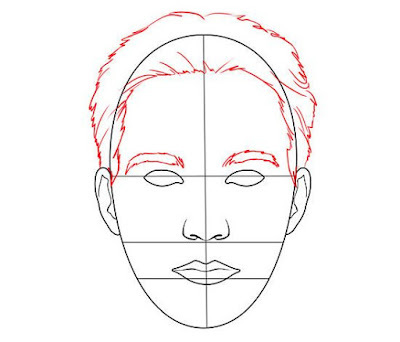 Lastly I added a bit of contour to the face, using a pencil. Wow! Such a stunning scene! Just look at those eyes ♡ Thank you Pauline! If you have missed any of this weekend’s ‘catch up’ posts you will find them HERE! We still have lots to share with you so grap a cuppa and enjoy. Hi there! So sorry our blog has been neglected of late! 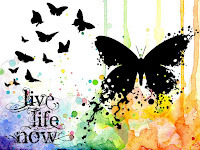 It has been a crazy busy time with the UK trade show last week and our TV show next week! the beautiful ‘Born to Perform‘ set. I blended them around her. I added the stars and the sentiments, again heat embossing with black. and on top of the Tutu, whilst the Stickles are still wet, I added soome different coloured glitters. along with some awesome Visible Image Stamps, some Donna Downy stencils, and some Stamps by Ryn. Isn’t our ballerina fabulous… it’s all in the detail, from the shading on the silhouette to the ink spraying off her tutu! The passion that goes into every single one of Mark’s designs shows through..
we were told that a lot at the trade show last week! and we are overwhelmed by the number of orders we have already received for this set. this weekend, catching up with all the latest cards and projects created while we were away! So be sure to pop back soon! You could be the lucky winner of our incredible Shining Bright stamp set! Find this photo on our Facebook page and follow the instructions to enter! 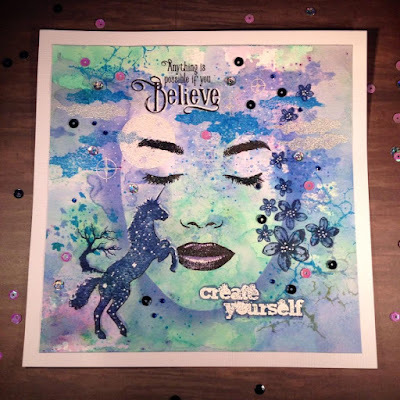 Mark will be on Create and Craft TV next Saturday, March 4th at 10am with some of our incredible NEW stamps..
As promised, we will have loads of fabulous inspiration for you over the next few weeks. 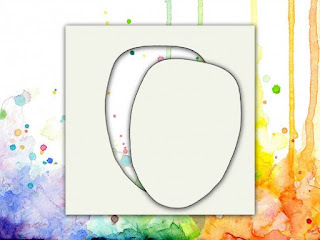 Just when you think your Design Team cannot possibly get any better…! 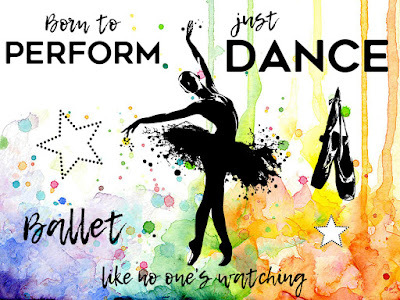 This image of the ballerina from the Born To Perform set of stamps by Visible Image, is truly the most beautiful image of a dancer I have ever seen. I have sought an image like this, and then Mark delivered, without even knowing how high up on my wishlist this was! If you know anything of my style, you will understand (and sympathize) how hard it was for me to achieve this effect. I needed to keep the white space but my, it was a challenge that I enjoyed! To get the background effect I took three of the new Nuvo Aqua flow pens, in Aqua Splash, Indigo Dawn, and Spiced Ginger. One by one I dropped liquid from each pen onto a large acrylic block and pressed it onto watercolour card, drying with a heat gun between each press. If you don’t dry between colours, they can merge and go murky. It’s a slow process but SO worth it to get the optimum result! 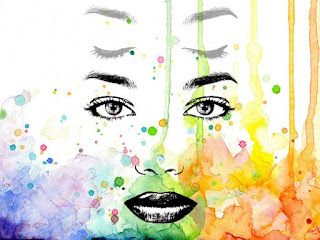 And you can add more colour if you feel it needs it. 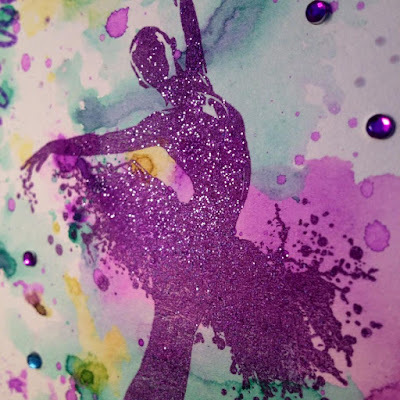 I then stamped the dancer in purple pigment ink, which remained wet long enough to be able to add glitter purple embossing powder, and which I then heated with my heat tool. You can see here that I then got a little splatty, mixing a couple of drops of ink with water, in my palette, and flicking the brush over the watercolour card. Again, dry with a heatgun if you can. 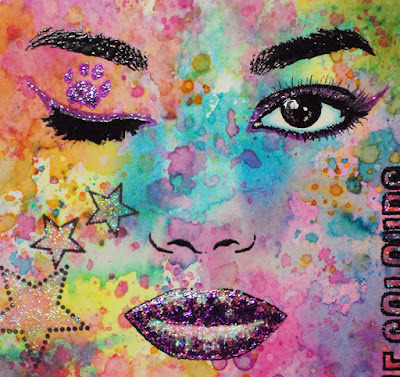 I also dotted around my image with an embossing pen and sprinkled the purple glitter powder over it, just to match the splash of the tutu! The final touches were to add the key words, and then some super tiny gems in toned colours. I hope they add a little movement and flow to the project. If you want to see more of Visible Image’s new releases for 2017 then click here! The next few weeks are going to be terribly exciting as Helen, Mark and the Design Team showcase all the new stamps from the February release! I’m off back to my creating, I look forward to sharing something else from the new release very soon. 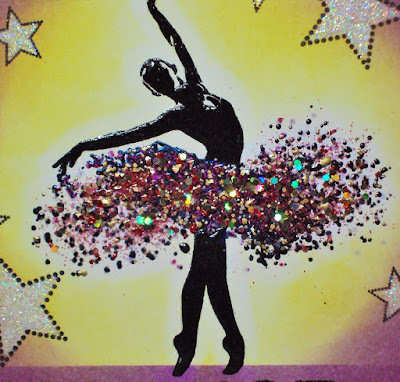 Such a gorgeous card Nicky.. loving your splatters of colours and super sparkly ballerina ♡ Thank you! 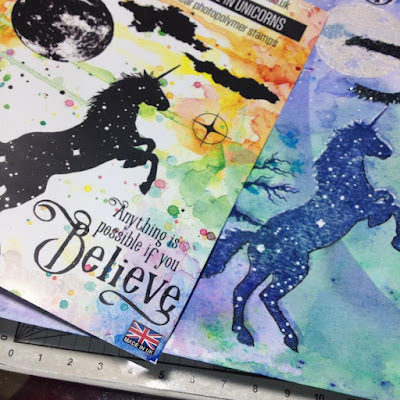 You will find more of Nicky’s wonderful cards and projects over on her blog. Thanks for stopping by today! Hope you’ll visit again soon. It’s Fabulous Friday, so my day to share some Visible Image Love. It’s an exciting day tomorrow 28th January, because all the new stamp designs can be pre-ordered! I stamped the skull onto a piece of white card, using Versamark, and heat embossed it with Black Powder, then masked it using Drawing gum. 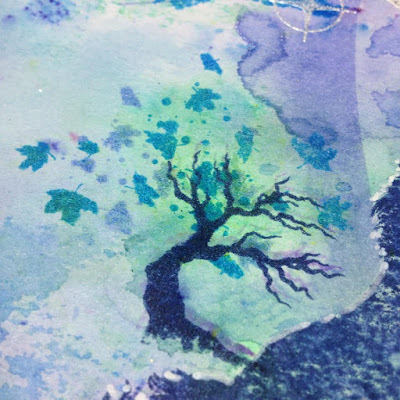 I blended Distress inks over the whole card, (Salty Ocean, Picked Raspberry and Mustard Seed), this combination was a little too vivid on this occasion, so I toned it down with a gesso wash (white gesso and water). 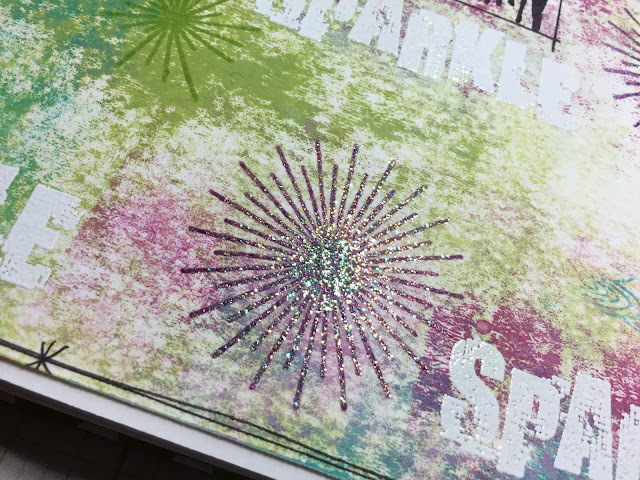 When it was dry, I stamped the Ink Splats randomly, using Mustard Seed then Picked Raspberry, I also edged the card using Blueprint sketch. 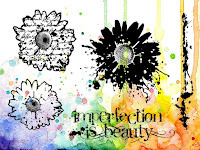 I stamped the stem (from the Imperfection is beauty set), around the edges, again using Blueprint sketch, and stamped the sentiment with Black Versafine. I then removed the drawing gum. I used Crackle Accents on the skull, just in the white areas, and left to dry. I made three flowers, with the sideways facing skulls, stamping onto copy paper using a Kaleidercolor ink pad, I shaped the ‘petals’ with a ball tool, then glued the ‘petals’ together at the narrow end, added a black gem to the centre’s, and covered them with Black Stickles, I also used some Stardust Stickles around the edges of the finished flowers. I thought that was it, but on the spur of the moment, I added a skeleton to the right of the image, stamped in Antique Linen Distress Ink, and highlighted with a white pen, and half a skeleton to the left. There finished !!!! Wow! Stunning background and Mr Bone Jangles is rocking those flowers! Very clever design and a superb project Pauline thank you ♡ You’ll find more of Pauline’s inspiring cards and projects over on her blog. so we hope you’ll pop back a little later to check out what we have in store for you! Hello there! Hope you are having a good day. Now let me tell you about the fun I had making it! Firstly I prepared my background with my newest box of delights…an incredible set of Kuretake watercolours, sent to me by a very dear friend. 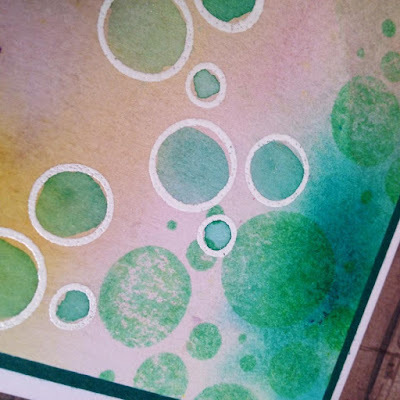 Oh my goodness, the vibrancy in these, I spent a whole evening just playing and making backgrounds by swooshing card over spritzed colour washes and allowing the paint to flow across the papers…it was heavenly! So when I selected my background for this, fortunately, it was very dry and this enabled me to stamp first the lips, for position and to get the edgy splatty detail, I stamped with clear Versamark and used Cherry Red embossing powder which I then set with my heat gun. 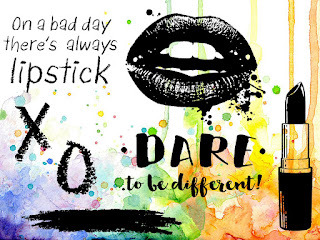 I also inked up the top of the sentiment stamp and used white embossing powder, which really stands out, then positioned the word ‘lipstick’ off-centre beneath the lips, as I had a plan for the lipstick. However to get a really clean impression, and to get the teeth white, I stamped again onto white card. The mouth : red embossing powder then I coloured over the ‘open’ part with an embossing pen, applying black powder, to create the depth. 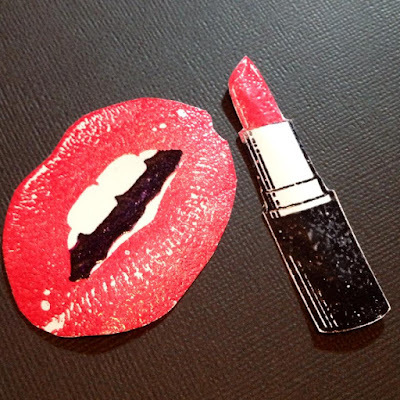 The lipstick: Clear Versamark and careful application of Cherry red over the lipstick, then black embossing powder over the case. 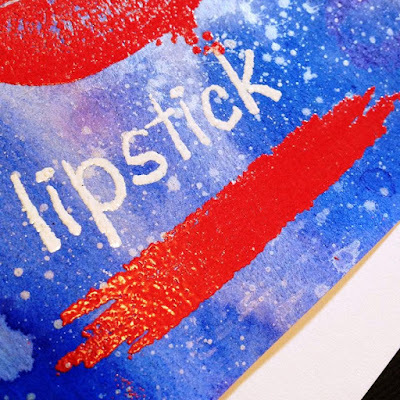 The actual slick of lipstick stamp that comes with the set is just so cool, so I used it under the word. 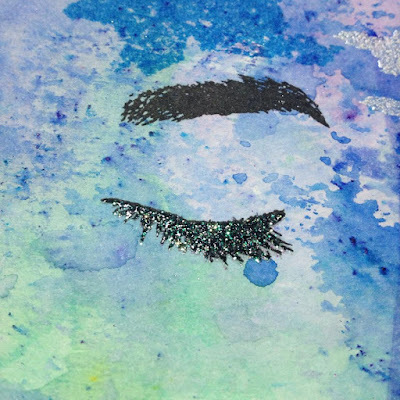 This close-up shot also shows how I created a bit of interest on the background by splatting a bit of watery white acrylic paint. I stamped the OXOs with purple distress ink so that it wouldn’t detract from the focal images, and I hope that it frames it all well. 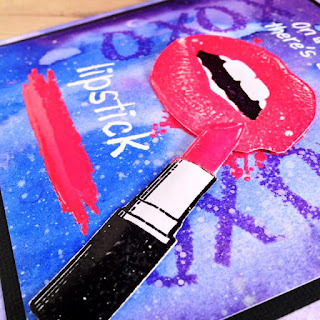 Last thing – Lip gloss! Well, glossy accents in all the right places, but mmm mmm, luscious lips!! Wowza! What an amazing card! Thank you Nicky ♡ That background is stunning and the lips look gorgeous! Have you seen our NEW stamps previews yet? Check them out HERE! Preview #3 is on it’s way soon!!! Jazzing Up The New Year! This jazz player from the “Jazz it Up” set seemed like the perfect way to kick off the new year. I hope everyone had a fantastic night for the New Year’s celebrations, partied hard and stayed safe. For me…it was down at the beach, slouching back in a camper chair and letting the fireworks fall down right over the top of me. Catching up with old friends, meeting new ones and having a couple of quiet drinks…it was another great night of seeing out the old and heralding in the new year. This is the beginning of my 2nd year with Visible Image and I can’t wait to see what exciting things Mark and Helen have in store for us all. Mark and Helen have also settled into their new HQ and are rearing to go. 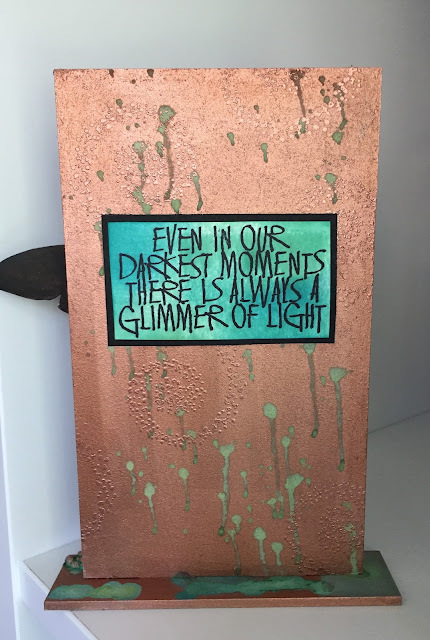 The background for this one is quite simple, using alcohol inks. 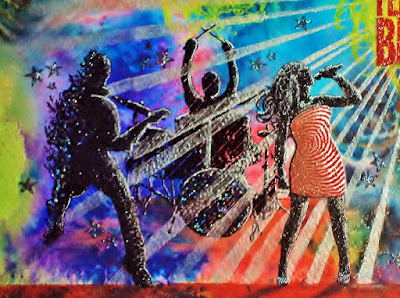 The brightness of the colours make the silhouette of the jazz player stand out. 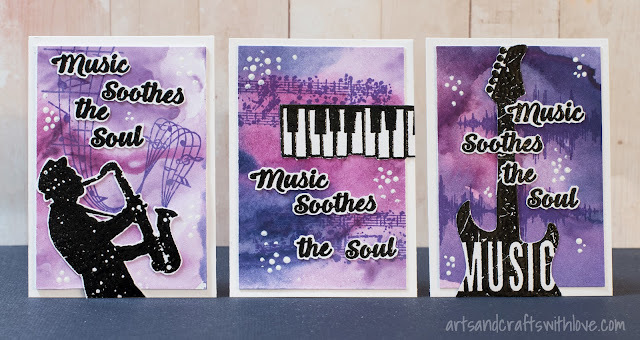 This Jazz It Up set has been a favourite of mine since the very beginning…so versatile and full of fun! I love the new additions to this set and what has been introduced across the whole range at Visible Image. 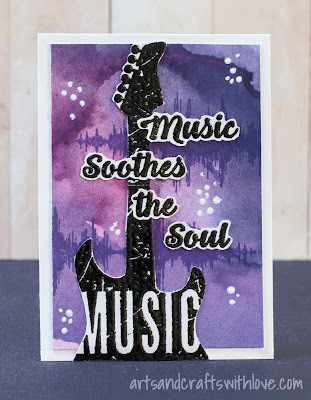 The new stars from the Feel The Beat set were a perfect finish for this card. Facebook Group where you can enter our monthly ‘Show & Tell’ challenge! Facebook PAGE exciting giveaways every week! Awesome card Dot ♡ Thank you! 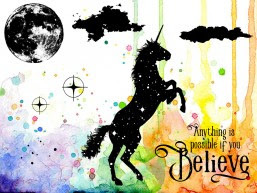 Your background is amazing! Thanks so much for visiting us here on the blog today, you’ll find loads more inspiration in our project galleries too! 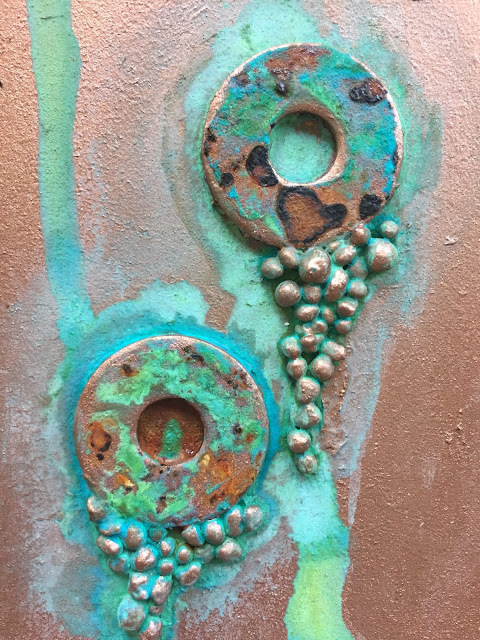 Come back tomorrow to see what Teresa Morgan has created as her first project of 2017! Hi there! Thanks for coming to visit us. I loved this set when it was first released, and the new improved version is just amazing!! The addition of some tiny birds and the detailed branch border make it so versatile. I stamped and embossed the large crow with black embossing powder onto some white cardstock then used a Sizzix die to cut the torn edge top and bottom. (I carefully cut around the base of the bird with scissors). I then die cut the strip that was to go along the bottom edge. Both these pieces were coloured with Distress Inks to create a burnt effect. I took another piece of card, stamped and embossed the border stamp in white, and used yellow and orange Distress Inks to colour behind. This piece is attached to the card base behind the main piece and bottom strip. I stamped and embossed the tiny birds, and added some orange Distress Ink to the design on the large crow. 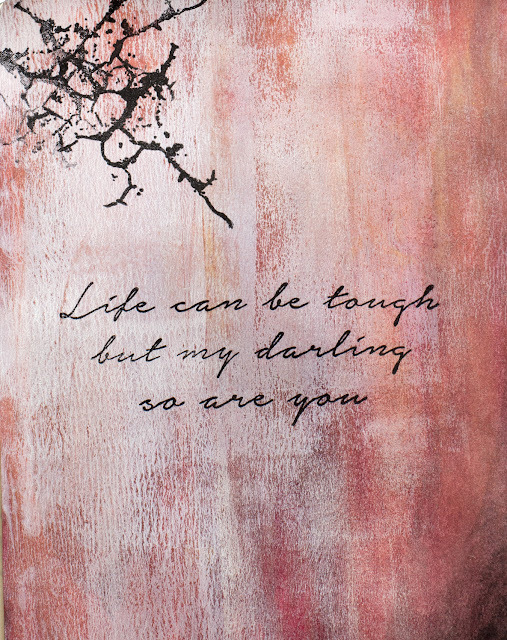 The sentiment is stamped and embossed onto another scrap of card, and given the same treatment with Distress Ink. 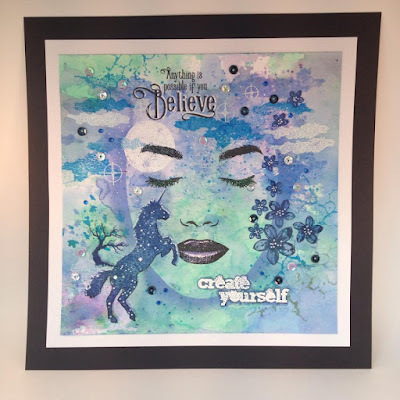 You can see more of Teresa’s projects over on her blog. 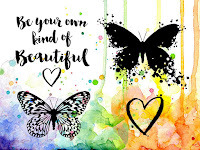 And… make sure you show us what you create with our stamps, for a chance to WIN a £25 coupon over in our Facebook group! Thanks again for visiting us today… hope you’ll also give our Facebook Page a like! 🙂 And follow us on pinterest and instagram too! And of course you can get your hands on all our awesome stamps in our shop. Hello, thanks for stopping by our blog today. 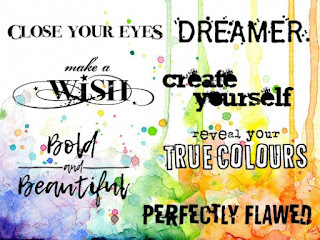 I’m back with more Design Team inspiration for ‘Visible Image’, using a couple of awesome stamp sets..Where Dreams Take You and Live Life Now. I stamped the fabulous eye, using Versamark, and heat embossed it using a Wow Red powder, yummy. I stamped the eye again with black ink, onto a sticky note, and fussy cut it out, I placed this mask over the embossed eye, and coloured the background using Distress Inks. I then stamped the ‘Go where your Dreams take you’, again using Distress ink. 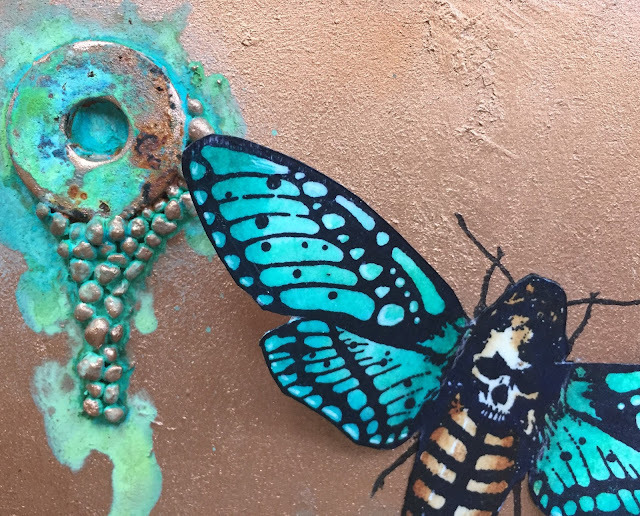 I stamped the small butterflies with Versamark, and heat embossed them with the red powder, I then took the mask off, and coloured the Iris, and put a bit of shading into the corner of the eye. 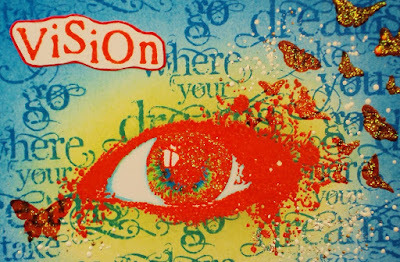 The ‘Vision’ sentiment was stamped with Versamark, onto a separate piece of card, and again heat embossed using the Red powder, and fussy cut. I used Stickles, to bling up the butterflies, and to put a twinkle in the eye. Time for you to get out your Visible Image Stamps, and enter the December Challenge, just create a card, using only Visible Image stamps, and enter HERE, for a chance to win a £25 voucher, to spend in their shop. Stunning card Pauline! ♡ Loving our fantastic eye in red! 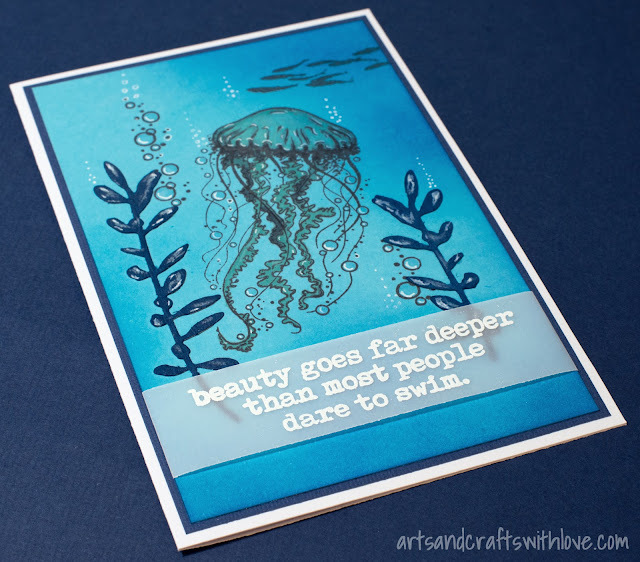 You’ll find more of Pauline’s cards and projects over on her blog. We’ll be back with more gorgeous inspiration to inspire you, so come back and visit us again soon!